Remember the SEAT Leon Cupra 280? Launched at the start of 2014 to a flood of praise and accolades (including from myself), it was seen as one of the best hot hatches on the market. Well, that’s so last year, because the Cupra 280 is gone. Instead we’ve got a Leon Cupra 290 and, as you might have guessed, it’s got a power increase of 10PS courtesy of a mild ECU remap. Which might not seem like much but, as a certain supermarket giant likes to remind us, every little counts. It takes the Leon’s output even closer to the Golf R, beats the Focus ST with ease and matches the Megane 275’s recent power hike. Not that you’ll notice much difference. The official acceleration times for the Cupra 290 are exactly the same at 5.7 seconds for the DSG and 5.8 for the manual transmission and top speed is still limited to 155mph. Economy and CO2 emissions are identical but the peak torque of 350Nm is at least available across more of the rev range than before, from 1,700rpm all the way to 5,800 rpm. Of course, you could go to an aftermarket tuner and get 4 or even 5 times the power increase along with some extra torques for a few hundred quid. The trouble is that might upset SEAT’s warranty department so if you want a little more power this is one way of getting it without affecting your Leon’s warranty. No official word on prices yet but expect to see a slight increase from the 280’s £28,485 OTR. The post Every Little Counts For SEAT Leon Cupra 290 appeared first on Driving Spirit. With the 2015 Volkswagen Polo GTI switching to a new engine, it was only a question of time before the SEAT Ibiza Cupra followed suit. So now it’s the upcoming Ibiza’s turn to drop the venerable twin-charged 1.4 TSI and upgrade to the more powerful and cleaner turbocharged 1.8 TSI. As you’d expect there are improvements in every area of the Cupra’s performance. Power is up from 180PS to 192PS while torque rises from 250Nm to 320Nm, and is available from 1,450 and 4,200rpm. 62mph arrives in 6.7 seconds and top speed goes up to 146mph. There are no official figures yet for economy and CO2 emissions but expect to see slight improvements despite the increase in engine capacity. Another aspect that could affect those figures is the choice of transmission. The Ibiza Cupra is now available with a six-speed manual transmission, replacing the compulsory dual-clutch seven-speed automatic transmission. There is a DSG on the options list, this time with six ratios, and it’s emissions where to buy generic aciphex in the united states figures are likely to be lower than those of the manual. With the new engine comes options to tailor the Ibiza’s drive characteristics. Cupra Selective Suspension is an adaptive suspension control system that lets you choose between comfort or sport modes, with a different steering feel in each. There’s also a host of electronic driver and safety aids; the latest XDS electronic differential lock, ESP electronic stability system, hill start assist, multi-collision brake and drowsiness warning are part of the standard safety package in the Ibiza Cupra. There are improvements in the interior too. The detachable infotainment system and its horrible cradle are gone, replaced by a touchscreen system that’s been properly integrated into the dashboard. The infotainment system has a wide range of functions but it’s worth noting that it now supports both Apple Car Play and Android Auto, allowing you to control your phone through the Ibiza’s touchscreen. No news on UK prices or availability yet, other than it’ll go on sale in early 2016. 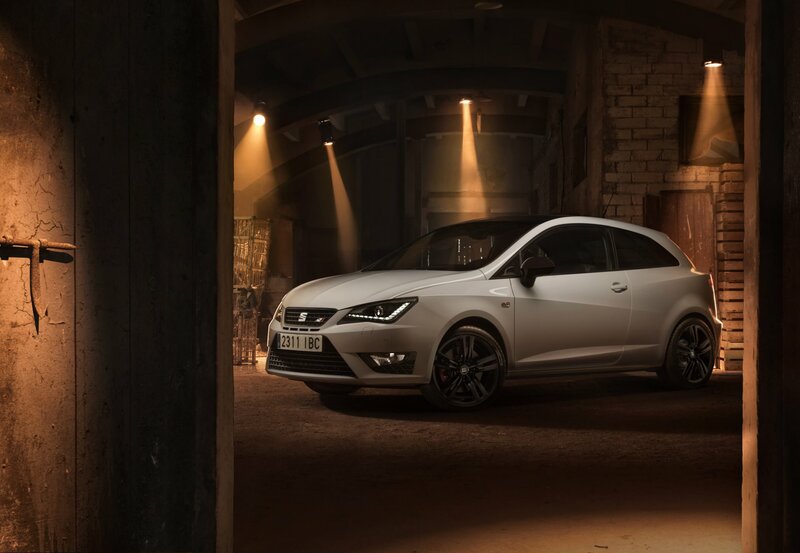 The post New Engine For SEAT Ibiza Cupra appeared first on Driving Spirit.